The 6th annual Illinois Invasive Species Symposium will be held on May 23 at the Champaign County Extension Auditorium in Champaign, IL. 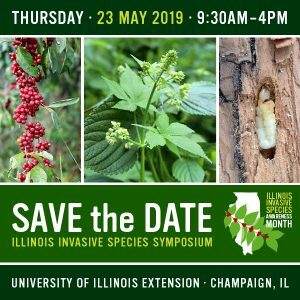 Mark that date in your calendars because this event will provide an opportunity to learn about projects and programs underway to address all taxa of invasive species that are impacting Illinois’ natural lands and native species. Registration will open for the symposium in late April. We are now accepting abstract submissions for presentations. Presentations should be on invasive species projects, research, or programs in Illinois. We are accepting submissions of presentations on all taxa of invasive species. Presentations will be 20-30 minutes in length. Please email abstract submissions to [email protected] by April 12, 2019. Authors will be notified by April 29.